Here in America, we’re annoyingly used to advertisements breaking up the racing action on television, but this caution-causing ad smack that happened in the 12 Hours of Sebring is a next-level nuisance. IMSA loves to put physical trackside ads out for its races, which the drivers sometimes like to collect like power-ups in Mario Kart. This time, Lexus 3GT Racing driver Dominik Baumann was the unlucky one behind the wheel when the hood of his No. 14 RCF GT3 popped up. Because he couldn’t see, he veered off track straight into a Tequila Patrón advertisement. A caution was called for the loose hood/loose ad combo, momentarily pausing the action on track. 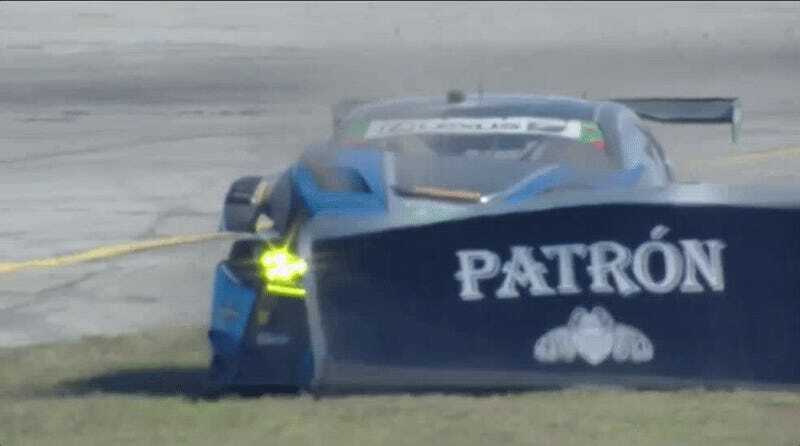 Cars making a mess out of the trackside ads is a bizarrely common thing for an IMSA race. At some point, even though I hate how they look, those cheesy digital ads that F1 uses start to look pretty good in comparison. You can’t drive into those. They weren’t the only Lexus to experience a little love tap this afternoon at Sebring, although their sister No. 15 car was actually the recipient of one from another vehicle. Right before No. 14 had its ad mishap, the No. 15 RCF GT3 accidentally stopped in the wrong pit stall, holding up the No. 912 Porsche 911 RSR behind it. Porsche driver Earl Bamber then proceeded to tap the Lexus to let him know he was in the way. We’re now just past the halfway point, and Pipo Derani currently leads the race overall at the time of this writing in the No. 22 Tequila Patrón ESM Nissan. Unfortunately, a car-b-que coming out of the tailpipes of the Ricky Taylor’s No. 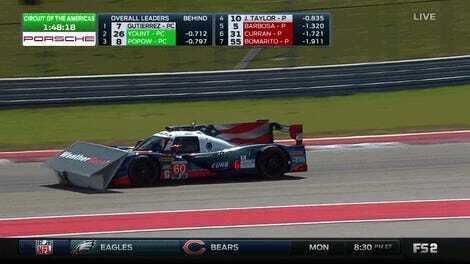 7 Acura—one of the front-running cars of the race—paused the race again after the Lexus whacked the ad. Taylor’s Acura sputtered to a halt when the flames appeared, and the Team Penske Acura crew are preparing to fix it back in the garage. It wouldn’t start back up again, so it was towed back in. Shortly after the race was restarted, the No. 14 Lexus had the same issue that caused it to hit the sign—the rear clips of the hood popped up, forcing him to drive carefully back into the pits for a more substantial fix involving a new hood and quite some amount of tape. The No. 25 BMW M8 GTE leads the GTLM class, which is a big change in pace over their heavily restricted performance at Daytona. The No. 33 Riley Motorsports Mercedes-AMG GT3 leads in GTD. The race isn’t even close to being settled at the halfway mark, though. The front runners in each class are tightly packed together, so we should have a highly entertaining six hours ahead of us. UPDATE [5:10 p.m.]: The No. 7 Acura has since retired because of this engine problem, and the No. 14 Lexus was called into the pits back again for a loose hood, as the tape clearly didn’t solve the problem. UPDATE [7:18 p.m.]: The No. 6 Acura has now also retired after Juan Pablo Montoya lost drive on track, so today won’t be Acura’s day.